The 2017 Zenith Chronomaster El Primero Grande Date Full Open follows in a grand (no pun intended) tradition of El Primero Grande Date watches but instead of a singular open heart, now features a fully skeletonised architecture. 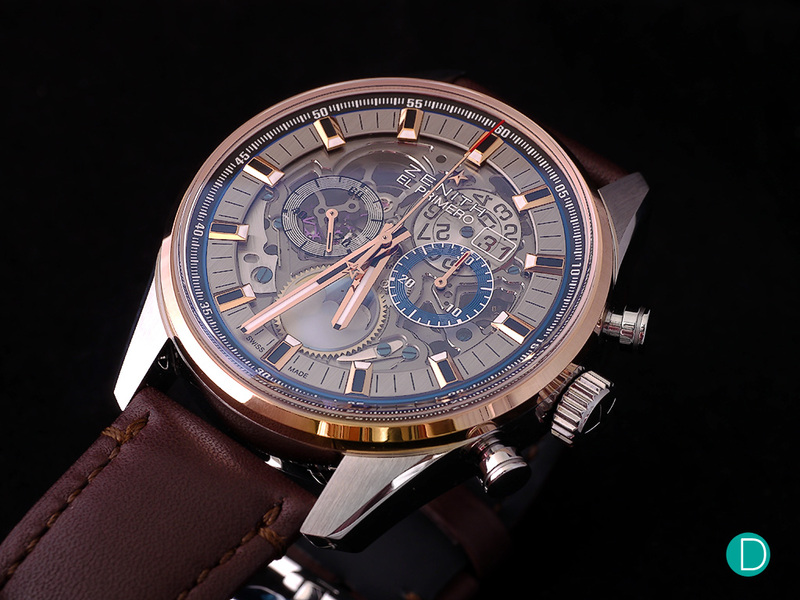 Featuring a sapphire dial which exposes both Grande Date discs, dual-disc day-night and moonphase complication, the bold design of the new El Primero Grande Date Full Open can be credited to Biver and his well-known penchant for skeleton style watches (Unico, Heuer 02 Chronograph, shall we go on?). Thus, those familiar with the classic elegance of Zenith will find this iteration a bit polarising. That said, the brand’s newfound swagger might entice those unfamiliar with the brand to take a second glance at one of history’s most beloved watchmakers. 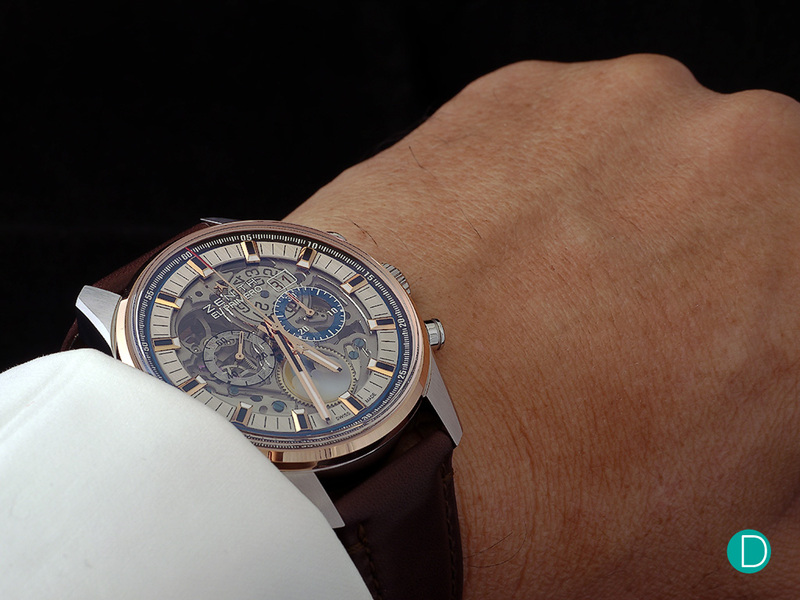 When it comes to such a storied and legendary movement (the world’s most precise serially produced chronograph, slated for destruction but hidden and saved after a watchmaker disobeyed orders, now revived), wouldn’t you want to ensconce such a powerful legend in crystal clear sapphire for all and sundry to admire? 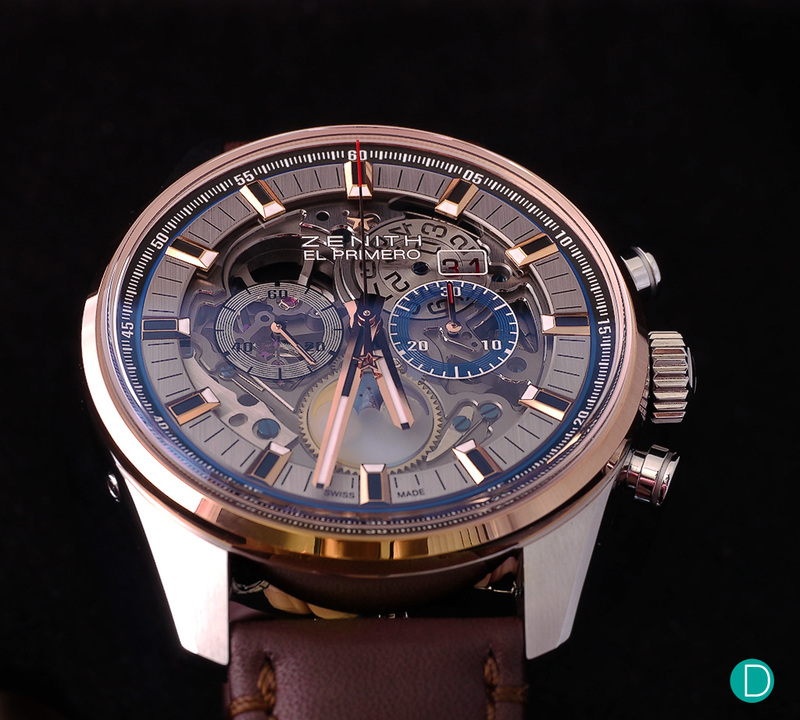 This is the raison d’etre for the new 2017 Chronomaster El Primero Grande Date Full Open. 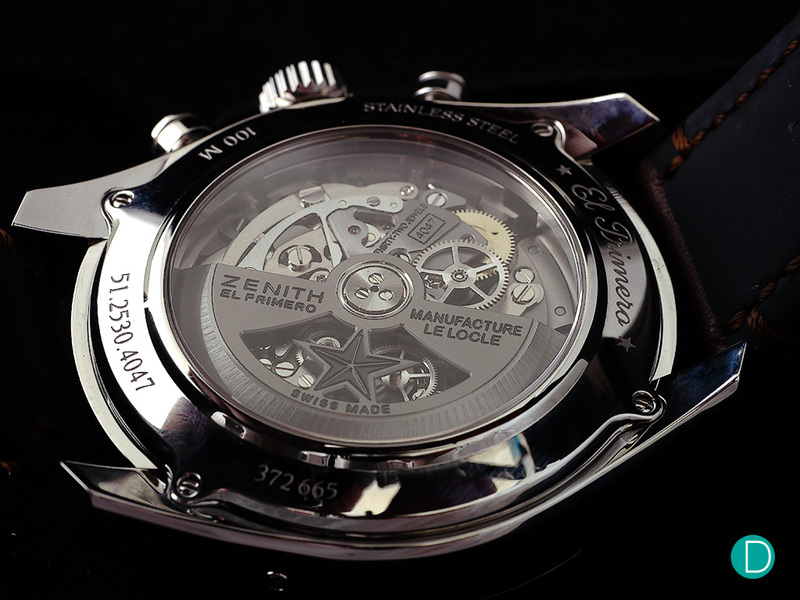 The performance and precision of a manufacture at its Zenith (pun intended) is on full display and in this instance, rather than giving you a mere glimpse of the silicon escapement, now fully open in a sapphire dial for all to enjoy – in particular, the same plane date discs and the gear train which drives the subsidiary seconds. Sharing the same dial layout as the previous editions, I find that the new Zenith Chronomaster El Primero Grande Date Full Open excels at taking what could be an extremely busy dial and finding some beauty in the apparent chaos. Refined gold polished applied indexes anchor the watch visually, pulling your glance inward towards the central displays of the dial. Given the backdrop of silvery-slate grey components, the most contrasting element being the 30 minute counter at 3 o’clock fringed in indigo like perimeter of the dial, which feels a little odd given the prime position of the transparent date window between 1 and 2 o’clock with a red background, playing up the contrast of the skeleton numerals. Mirroring the 30 minute counter is the 60 second counter at 9 o’clock. Oddly, for a precision chronograph, Zenith has done away with the pretense of even reckoning precise sub seconds – there’s no longer a red tipped prong on the tri-prong spinning counter, thus you’re never really sure as to what manner of seconds you’re at. But as we have argued before, the watch is now akin to animated mechanical mastery than precision instrument, any technical excellence lies in its execution and delivery rather than in the manner with which we perceive it. At 6 o’clock, sits the moon-phase (complete with a 59-day double-lunar cycle) which while an additional, almost iridescent (due to the mother of pearl elements) splash of colour and whimsy, is actually one of the most refined and elegant of the elements. Yes, there are over 332 components but reality is that you do not look at the entirety of the components at once and so, there is some order in the chaos especially when the twin transparent grey and indigo counters ground the look in familiar nostalgia and aesthetics of the original 1969 model. A silver minute rail is framed by a blue ring – a design element which anchors the 30 minute counter and provides a partition with the black and white 60 second rail on the edge of the dial. Luminescent facetted hands and hour-markers, ensure optimal night legibility, while I felt they could be made thinner so as not to obscure the view of the inner workings, it would have unbalanced the design. The red-tipped chronograph second hand with red skeletonised star counter weight is a nice touch especially when the emblematic Zenith star sweeps over this transparent display during chronograph operations. Zenith’s legendary El Primero chronograph calibre really doesn’t require further introduction but the broad stroke is that inside beats a high frequency balance of 5Hz or 36,000 bph which is what allows the watch to display the exceptionally precise 1/10th of a second display, the El Primero Calibre 4047B is no different with the exception of the big date and moonphase complication. Armed with a silicon lever and escape wheel, the 332-part El Primero Calibre 4047B movement is competently finished – there are no artisanal flourishes but it’s still attractive for a serially produced chronograph calibre. Torque from the main barrel must be pretty strong as well considering that it drives two additional complications without strain on the power reserve and day/night moonphase which orbits every two lunar cycles or 59 days and the obvious day/night indication which completes its turn every 24 hours. Pictured in two tone steel and pink gold here, it looks exquisite on leather while on bracelet, it’s a bit of a mixed bag as it feels a little harsh with the dressy aesthetic. The bracelet option is only advisable on full steel version. That said, for SG$15,900 you get a legendary chronograph with two spectacular complications – namely the big date and the moonphase and the dressy aesthetic of the 45mm Chronomaster Grande Date Full Open makes it a very versatile timepiece – dressed up in leather or ruggedly casual with bracelet.